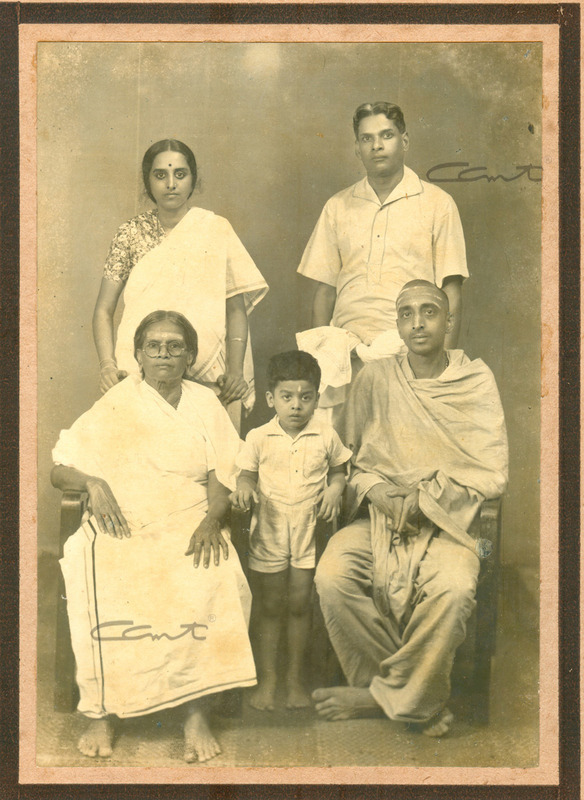 Standing: Kanakam (Balan's sister), her cousin Bhaskara Menon who was the second child of Kochu Amma (seated). The boy is Balachandran Verma, Kanakam's youngest son. Bhaskara Menon was the third child of Kochu Amma and elder to Balakrishnan by ten years or so. They grew up together and Bhaskarettan, as the elder brother, would chastise the young Balan who was very mischievous. When Balakrishnan became Swami Chinmayananda, the family found it very difficult to accept it. How could the bright young fellow, full of pranks and so fond of a good life, who enjoyed wearing fashionable clothes and playing tennis become a sannyasi in ochre? Kochu Amma was, of course, very happy. And at the first sight of Swami Chinmayananda, the elder brother Bhaskaran fell at his feet and prostrated full length. Now their relationship gathered a new glow. When Swami Chinmayananda started getting his Upanishad commentaries published, he had no place to store the books. Bhaskara Menon made his own house and wooden cupboards available as a godown. He also extended the much needed financial help. Though they had six daughters and two sons, his wife Vilasini did not hesitate to pledge her jewellery to send money for the book publications. Bhaskara Menon’s family has donated more than 450 letters of Gurudev to the Chinmaya Archives. The first of these was a letter to his mother, written by Gurudev as a student on February 26, 1941 from Butler Hostel.